Multitasker print by Etsy seller Britsketch, aka Brittney Lee. I love graphic novels, but as a bookseller, I constantly encountered parents who didn’t consider graphic novels “real books,” or at least assumed that regular books, no matter how silly or poorly written, were better than any comics. Manga, in particular, got the side-eye. So I was happy to see two posts lauding graphic novels for kids, one by a former contributor to Cookie and the other by The Pioneer Woman. 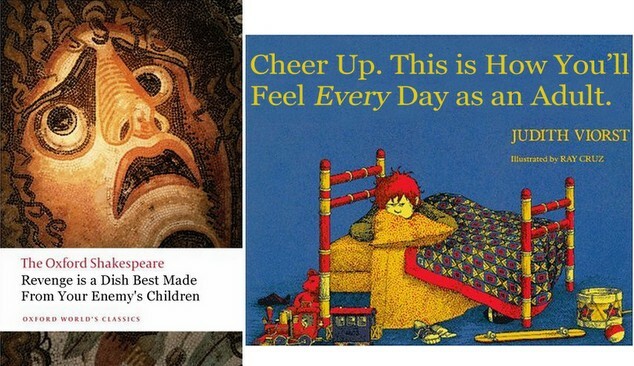 Who doesn’t love Better Book Titles? Above are two recent favorite entries. I recently read Anne Fadiman’s Ex Libris, one of the best odes to reading ever written. She mentions her father, Clifton Fadiman, several times throughout the book, which is how I discovered Information Please, the witty & intellectual radio show he hosted in the 1930s & 40s. 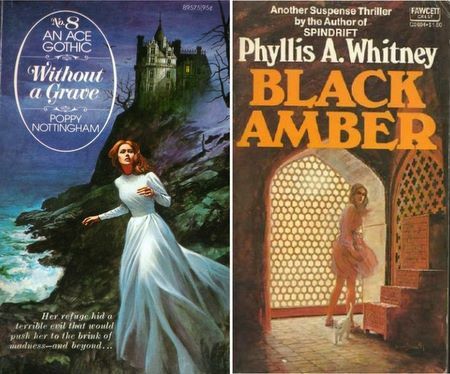 I’ve shared Cat Party’s obsession with old-fashioned Gothic romance covers since my Phyllis A. Whitney days. any graphic novel suggestions? the only i’ve read that i actually liked is persepolis, others sometimes i found teh drawing beautiful but the narrative didn’t really get me. although i should also admit that my primary source for graphic novels is the free book bin in the office. Yay! I wanted someone to ask that question. If you like Persepolis, maybe Guy Delisle’s travelogues Burma Chronicles or Pyongyang? Delisle can be obnoxious, but he offers a rare glimpse into life inside totalitarian regimes. Rick Geary’s well-researched Victorian Murder series is good if you like history/true crime (my fave is The Bloody Benders). And if you like revisionist fairy tales, I recommend Castle Waiting. David Small’s Stitches is a devastating autobiography. If you want something cute & happy-making, everyone loves Yotsuba&! & Chi’s Sweet Home. Finally, the best comic narrative I’ve ever read is One Piece, a shonen manga. It’s 60+ volumes, takes about 9 volumes to get into, and is not for beginners. But it’s amazing. thanks for the suggestions, i actually ended up buying kyle barker’s nat turner book right after i asked you. alas, via alibris so it will probably take a month to arrive. what i like is barbara pym, or vivian gornick, i.e. books about grown women of a certain age. i have yet to find that in a graphic novel. That’s a tricky one, comics skewing so decidedly younger and male. I do think you’d like Castle Waiting, but also–and I haven’t read this one, I’ve just heard unanimous praise for it–Fumi Yoshinaga’s All My Darling Daughters. I’d also maybe recommend Emma by Kaoru Mori, though you’ll have to read scans online for the later volumes, and Ai Yazawa’s NANA. thanks! all my darling daughters sounds quite promising. i’ve always thought vivian gornick’s approaching eye level would make a good graphic novel, or graphic essay i guess… so much of it is observation of dialogue.